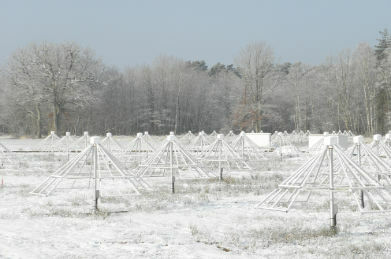 Located on the site of the Nançay Radioastronomy Station, which gathers in the heart of Sologne French radio telescopes observing at frequencies ≤ 3 GHz, NenuFAR is a very large low-frequency radio telescope, which will be among the most powerful in the world in its frequency range between 10 MHz and 85 MHz. This range corresponds to the lowest spectral “window” in which we can observe with radio telescopes from the surface of the Earth. NenuFAR, optimized for the frequency range from 10 MHz to 85 MHz (wavelength λ from 4 m to 30 m), will have there the best sensitivity. the study of pulsars (hyperdense and strongly magnetized dead stars in rapid rotation) at low frequencies. 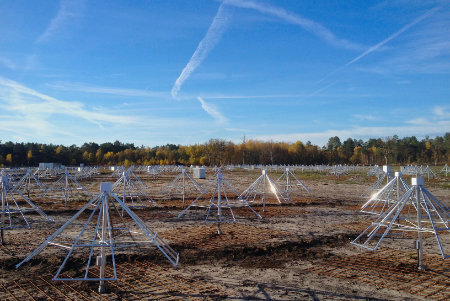 LOFAR (http://www.lofar.org) is the pathfinder of large radio arrays. 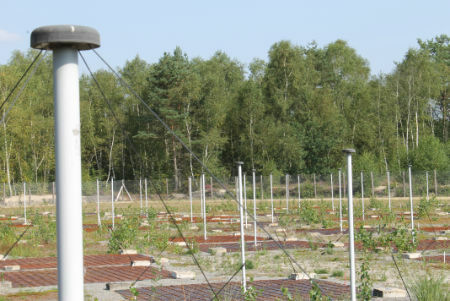 Consisting of approximately 50 antenna arrays (or “stations”) distributed throughout Europe (including 1 in Nançay) connected by high-speed internet to a calculator in the Netherlands, LOFAR excels at exploring the frequency range from 110 MHz to 250 MHz (λ = 1.2 m to 2.7 m) and has more modest performance in the 30 MHz to 80 MHz range (λ = 3.7 m to 10 m). It makes images of all kinds of cosmic radio “sources”, from solar system planets to galaxies and clusters of galaxies. 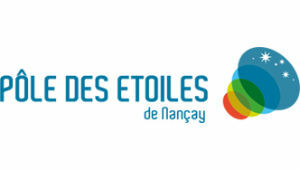 NenuFAR will be the world-class radio telescope with the best performance / cost ratio, with a total cost of order of € 10 million, funded mainly by the Region Centre-Val-de-Loire and the Region Ile-de-France, with contributions from the CNRS, the Paris Observatory, the Agence Nationale de la Recherche, and the Graz Space Research Institute. Currently 75% funded, NenuFAR is 60% built, in testing, commissioning and calibration phase. It will start its « Early Science » phase in 2019. Visit this site for results! 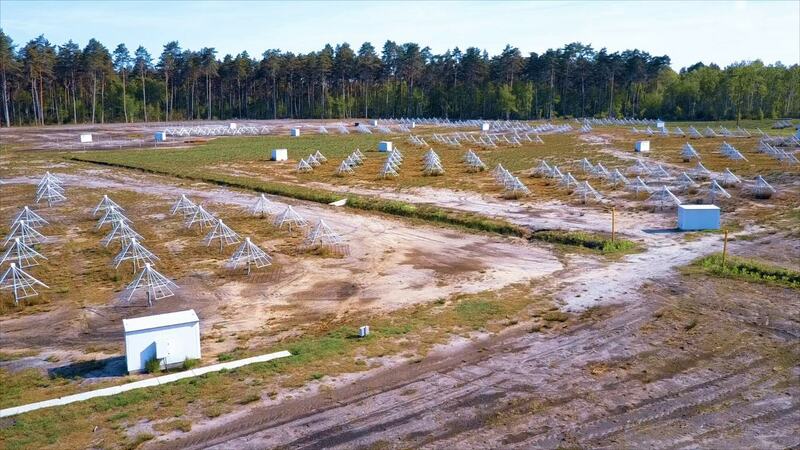 a LOFAR “super station”, giant extension of the Nançay LOFAR station allowing NenuFAR + LOFAR to make radio images of the sky at resolution ≤1 arcsecond. 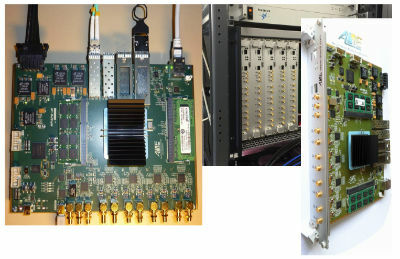 Based on the antenna originally developed by Burns Industries for the LWA radio telescope (USA), the “NenuFAR” antenna, coupled with a specially designed preamplifier in collaboration with the “Subatech” (IN2P3) laboratory, presents performance today unmatched in its observed frequency band. Eventually, 1938 will be deployed on the NenuFAR site. 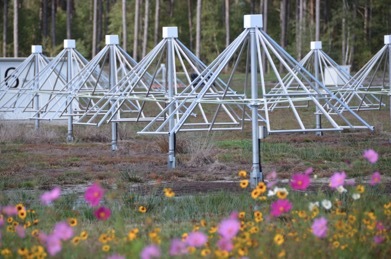 The antennas are grouped by subsets of 19 antennas called mini-arrays, whose topology has been studied to optimize the overall response of the radio telescope (antenna arrangement in the mini-array, rotation between mini-arrays). 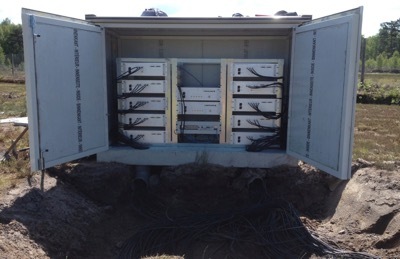 NenuFAR’s 96 mini-arrays are electronically controlled to point the radio telescope beam in the direction of the celestial source being studied. The detection and study of exoplanets (planets orbiting stars other than the Sun) remains to be done in radio. Nearly 4000 exoplanets have been discovered in the visible (http://exoplanet.eu), informing us about their orbits, masses, sizes, atmospheres, and revolutionizing the formation theories of our solar system. The radio detection will give access to the magnetic field of some of these planets and their magnetosphere, a protective shield that may favour the emergence of life. Radio detection of exoplanet magnetospheres will in turn revolutionize the physical theories governing the magnetized and ionized environment of planets. 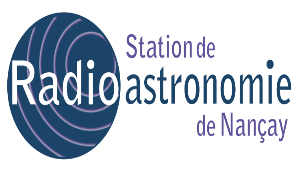 Radio emission is thought to be produced by the interaction between the planet (its magnetosphere or ionosphere) and the star (the stellar wind and the magnetic field). For hot Jupiters (giant planets orbiting very close to their star), an intense emission – detectable by NenuFAR – is predicted. 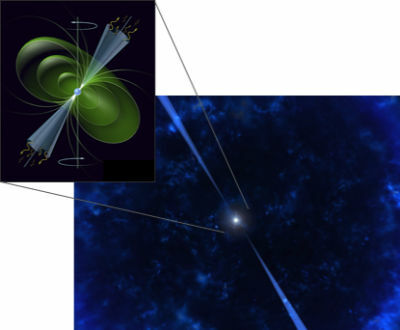 Low mass, active, eruptive or strongly magnetized stars should themselves produce intense radio emissions, similar to solar radio bursts but much more powerful. The distinction between radio emission from the star, the planet, or induced by the planet in the star’s corona, will be made on the basis of the frequencies, polarization, and temporal variations of the detected radiation. NenuFAR will explore this new and broad field of study. The detection of the radio signal of the “Cosmic Dawn”, the time of the formation of the first stars and galaxies, will tell us about the physics of the Universe through and at the end of the “Dark Ages”. This period during which matter and radiation interact very little extends from the emission of cosmic radiation (CMB, at 3 Kelvin, 400,000 years after the Big Bang) to the Cosmic Dawn, some 100 million years after the Big Bang. The desired signal is that of the neutral hydrogen (1420 MHz) shifted in the range of NenuFAR by the cosmological distance. Theoretical models predict a variation in the overall intensity of this signal and the distribution of its angular fluctuations as a function of time, and therefore of frequency. It is these angular fluctuations, at scales between 0.1 ° and 1 °, that NenuFAR will attempt to measure. A detection will identify the theoretical model or models best describing the evolution of the young Universe. 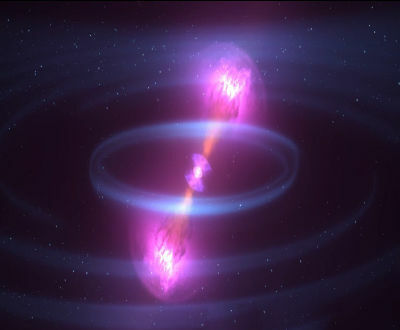 Pulsars are hyperdense and magnetized fast-spinning dead stars, emitting short regular radio pulses separated by a few milliseconds to tens of seconds (and sometimes subject to eclipses or signal extinctions of variable duration, that are still poorly understood). 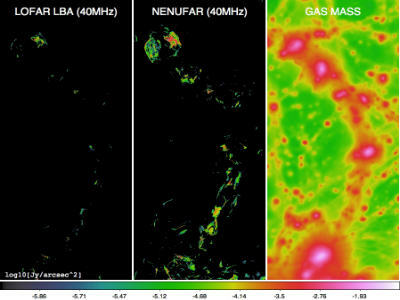 NenuFAR will make a census of the galactic population of pulsars, measure their spectra and the morphology of their pulses at increasingly lower frequencies (unveiling their magnetospheres), and the disturbances due to the propagation of pulses through the interstellar medium (informing us about the density, the magnetic field and the fluctuations of the latter, and making it possible to improve the timing of the arrival time of the pulses, a key to the detection of long-term gravitational waves). Many cosmic phenomena, often catastrophic, produce short and intense radio pulses (called “transients”), detected so far at GHz frequencies. The study of low-frequency radio transients is an almost virgin field. They may be due to the mysterious “Fast Radio Bursts” coming from cosmological distances, the hypothetical radio counterparts of Gamma-Ray bursts and gravitational wave events (mergers of neutron stars or binary black holes), showers of electrons produced by the impact of high-energy cosmic rays or gamma rays on the Earth’s atmosphere, and other yet unidentified sources. NenuFAR offers several modes of fast data acquisition adapted to these emissions. 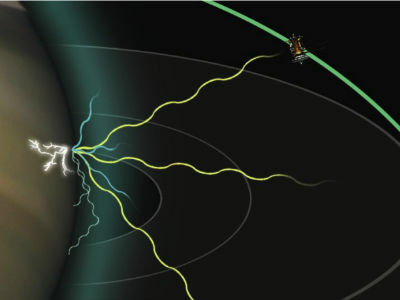 A special category of low-frequency radio transients is lightning flashes in the atmospheres of planets in the solar system. They have been detected on Saturn from ground and space, and on Jupiter, Uranus and perhaps Neptune from space only. The case of Venus is very controversial, with disputed detections. On Mars, intense electrical discharges are expected to occur in dust storms. Their study is interesting for planetary meteorology, but also the formation of complex molecules in atmospheres. Terrestrial lightning will also be detected, with a particular interest in those developing between the upper atmosphere and the ionosphere (poetically referred to as sprites or elves). A scientific field like radio astronomy may seem rather abstract to the general public. The radio images, the spectrograms, are not talking to who is not a researcher. To raise the visitor’s awareness of this science of the invisible which, like others, can arouse wonder, the Nançay Radioastronomy Observatory has called on the artist Cyrille Courte for the realization of an architectural and sound work : Le Dôme. 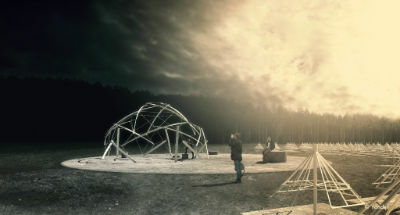 As its name implies, it will be a hemispherical structure erected on the principle of self-tension. By a clever game of balance, the assembled elements will form spirals in space. Inside the structure, the visitor can listen through a sound spatialization retranscription of radio waves detected by the NenuFAR array. 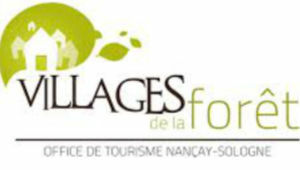 and DIM-ACAV+ of Région Ile-de-France, Agence Nationale de la Recherche.